“ The Italian fashion police shudders at the sight of American tourists in white tennis shoes and logo t-shirts”, a well-traveled friend warned us. Given that our image abroad is as devaluated as our dollar these days, my husband David and I headed to the airport for the mountain Mecca of the Dolomites with the latest “Italian wannabe” collection of hiking apparel. Between our Euro makeover and our phrase book, we hoped to win back some of America’s fans one grazie at a time. 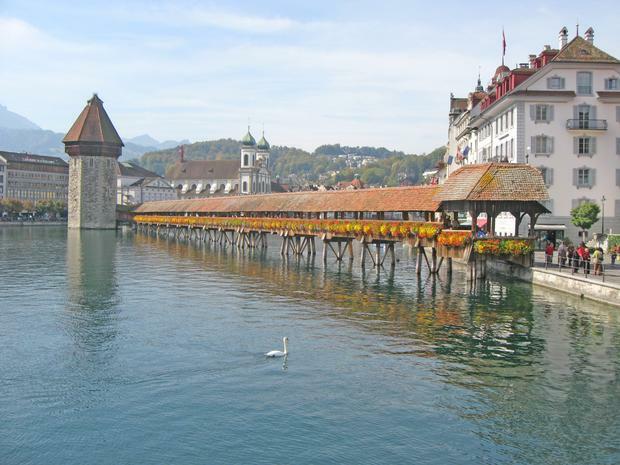 We touched down in Zurich where a friend whisked us to his home above the idyllic alpine shores of Lake Lucerne. After an evening of wining, dining and overnight Swiss hospitality, we hopped on a train to Bolzano, gateway to the Dolomite domain for seven freedom days of exploring, hiking, eating and sleeping wherever the road and trail led us between sunrise and sunset. 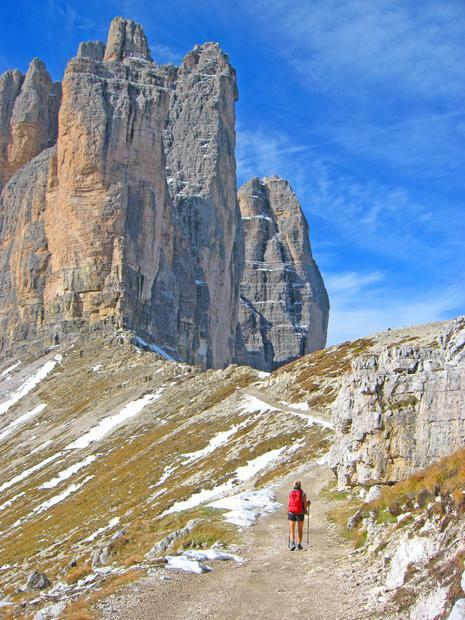 The Dolomites, concentrated mostly in the northern region of Italy, unlike the Alps are not a mountain range. Millions of years ago, a tectonic plate collision resulted in ancient tropical sea fossils and sediments being pushed up to form today’s checkerboard of peaks and craggy sentinels laced with lush story book valleys, forested slopes, rugged wilderness where bears and chamois goats roam, and Sound of Music meadows dotted with picturesque resort villages. 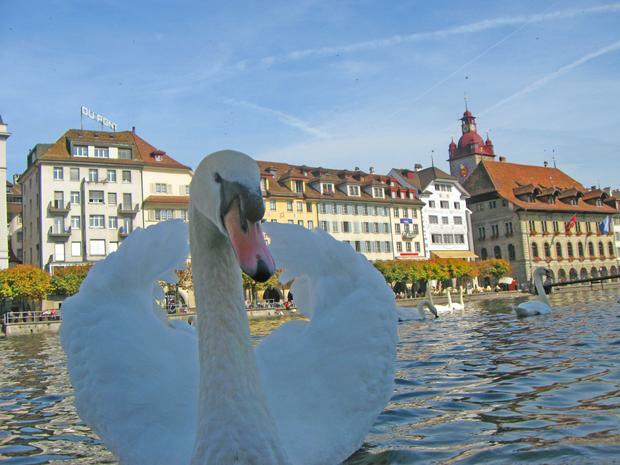 The cultural history of the region is as diverse and rich as its landscape. The Ladins, descendants of the Celts and Romans, retain their unique culture and language, while the Tyrolean architecture and bilingual signs (Italian and German) is no accident. The Sud Tyrol region extending south from the Austrian border was absorbed by Italy at the end of World War I, and retains its strong Germanic roots and an autonomous government. The caves, mountain top bunkers, and metal cables and ladders on the precipitous rock faces remind visitors of the fierce battles fought in this intensely contested region. Within minutes of packing ourselves into the little rental Fiat, we realized that our biggest challenge was going to be on the roads not the trails. David summoned his Mario Andretti alter ego to keep up with the Italian hair raising speed of traffic on the autostrada, which I continue to think should be renamed “autostressa”, while the hairpin curls on the narrow mountain roads further fed drivers’ adrenaline addiction. As the navigator, I did my best to match the not- so-consistent names on the map with the road signs as they flashed by. When all failed, David shifted us into holding pattern at the roundabout long enough for me to update our course. We celebrated surviving our first day on Italian roadways with a stellar five-hour hike in the Parco Naturale dello Sciliar. The gondola swept us up to the Alpe di Siusi’s magnificent meadow adorned with a tiara of dramatic rock steeples and vertical crags. Our apple strudel lunch stop at one of the trail side rifugios (mountain huts) set the tone for all trail lunches to come. Except for pizzerias at every corner, many restaurants as well as hotels in the mountain towns were closed after the exodus of summer tourists. We happily settled for a diet of hearty morning muesli at every bed and breakfast inn, a high noon flaky apple strudel refueling, ending the day with an insalata mista (mixed salad) highlighted by the never disappointing pizza marguerita. 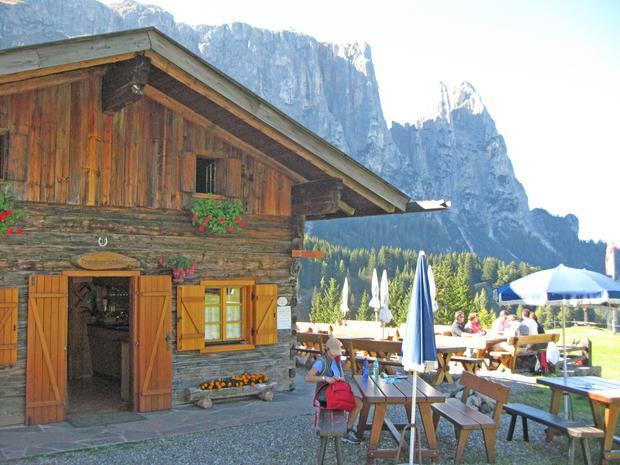 Without reservations and anxious to settle in before the cloak of darkness complicated navigation, we stopped in the charming Ladin hamlet of Ortisei in Val Gardena and spotted the attractive but ominously named Tyrolean style Hotel Hell. We stepped into the ghostly, but exquisitely furnished lobby skeptically at first until an ancient and cordial innkeeper greeted us guten abend (good evening). Between her choppy English vocabulary, the remnants of my college German combined with three hours of recent classroom Italian, I learned from Mrs.Hell, the innkeeper, that the hotel was closing the next day and that ninety euros would buy us a double room including dinner and breakfast in this impressively hand crafted inn. Over the course of the next few days, we experienced phenomenal to dynamic weather, a string of exalting hikes overlooking emerald lake basins and circumnavigating turreted massifs often adorned by centuries old rustic rifugios and grand hotels, our figures dwarfed beneath Father Time’s colossal sculptures, brains flooded with endorphins and souls bursting with contentment. Every new heart-thumping ascent revealed an alpine meadow sometimes against a strangely familiar backdrop of Pinnacles, lofty spires rising like Mono Lake tufas on steroids, and Sierra Minaret-like razor sharpened crags. Clouds would scatter to reveal stadium vistas of the snow covered Alps mimicking the Himalaya stretching to infinity across the horizon of solitude. Just when I thought I was so full on beauty I might explode, a wave of calm – nature’s opiate would flush my mind of chatter revealing silence and clarity. The dramatic mountain passes, portals to enchanting mountain enclaves seduced the camera lens and left me breathless, basking in scenic ecstasy. 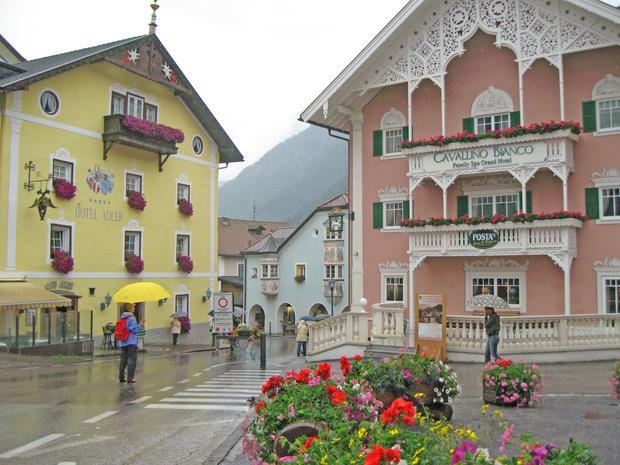 The only disappointment was Cortina d’Ampezzo, the fashionable ski resort touted as the “pearl” of the Dolomites. Popularity has unleashed a discordant sprawl in this spectacular valley and too many chi-chi generic retail outlets are smothering the village charm. We left Cortina’s dissonance for the Marmolada peaks, the highest in the Dolomites under somber skies lit up by lightning veins. A sign for the “Messner Mountain Museum in the Clouds” and the Rifugio Dolomite caught our attention. Two hours of switchbacks later, pounding rain had turned to a misty veil with barely an echo of thunder. Just short of the Monte Rite summit, a herd of grazing yaks crossed our trail. Given Messner’s historic relationship with Nepal, the yaks were a startling yet understandable element. But we were still intrigued by what brought this legendary Everest climber here. The exhibits revealed that Reinhold Messner was a Ladin whose childhood and family roots were in the Dolomites. We popped our heads in the adjacent rifugio hoping for a bottle of water and a slice of left over strudel. Instead, the lunch menu offered what David rated as “surprisingly delicious Yak stew”, while I savored a very palate pleasing zucchini lasagna, topping our meal with FRESH baked strudel. Later that afternoon, we skirted the shores of Lago di Fedeia just in time to feast on the setting sun’s rose hued frigid skies peering behind melting clouds, and claim a room in the only overnight shelter in sight. 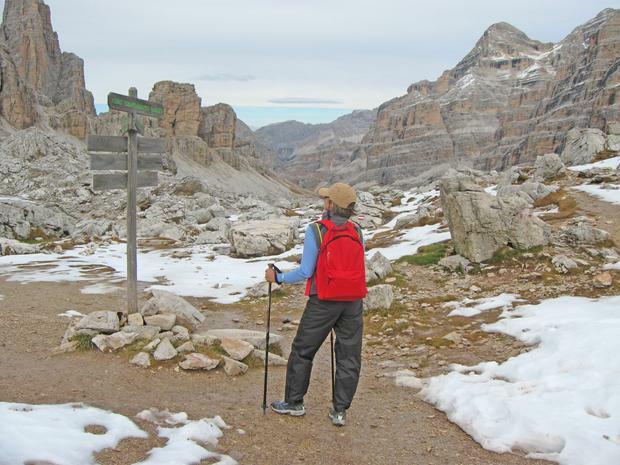 The 100 year-old Rifugio Marmolada, stood at the foot of the 3300-meter “Queen of the Dolomites” with stark resoluteness. In contrast to our clean but less than rudimentary sleeping quarters, the four-course dinner of soup, pasta, salad and flan was a five star surprise. The last day of our Dolomite pilgrimage ended on a high note paying homage to the Marmolada with a sunrise ridge hike for a panoramic view of its sun drenched glacial crest. We continued to be astounded by the scenery as the road unfurled out of the thin air realm into sheep dotted swales of green pastures with clusters of manicured chalet farmsteads. But the abrupt drop into civilization via a deep narrow high-speed canyon was somewhat jarring – our Fiat banking as if on a luge course. Culture shock sent us retreating up the tiny mountain hamlet of Klobenstein just above Bolzano, where we stumbled upon the classically plush hotel Bemelmans, one of Sigmund Freud’s favorite haunts. 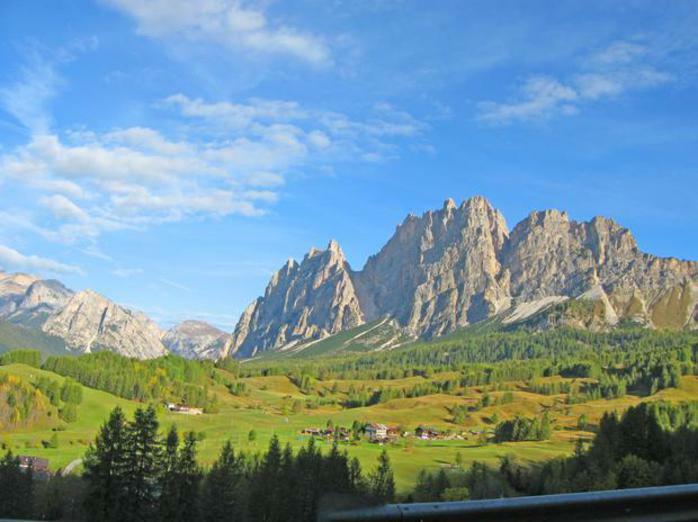 When he described the environs of Monte Renon as “divine”, Freud was surely speaking of the spectacular views of the Alpe di Siusi and other prominent Dolomite landmarks to the southeast. 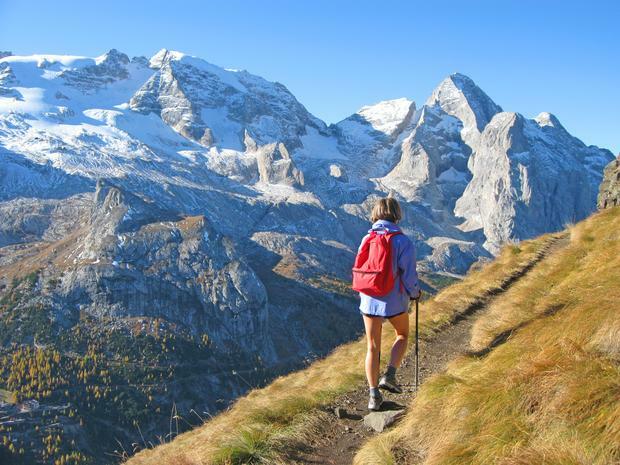 Reluctant to cut our alpine umbilical cord, we headed southwest through Madonna di Campiglio, one of Italy’s most popular nature playgrounds in the isolated, smaller and less known Brenta group of Dolomites. The valley was a cacophony of hammering and drilling with workers busy chiseling and grooming the town to ski season perfection. Tourist services including gondolas were all chiuso (closed). Meanwhile, the tension barometer was on the rise in the confines of the Fiat. Like addicts, we needed to get our edge off with a “fix”. We were hooked on hiking summits. 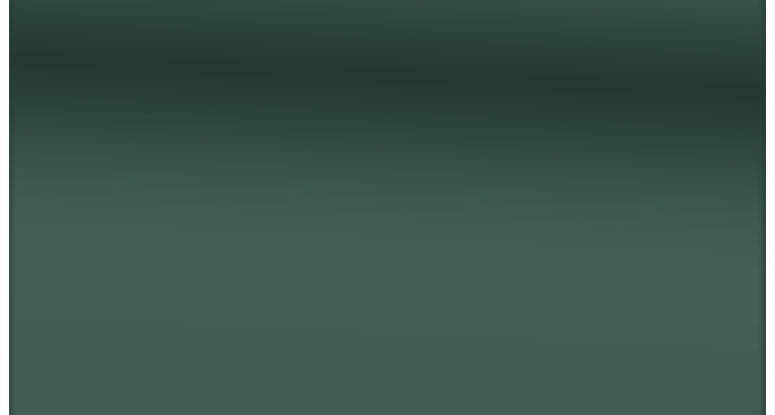 We parked and started to climb the closest slope. Propelled by wanderlust and primed by seven days of high altitude acclimation and muscle toning, we were indefatigable machines on a mission. Finally, we crested and emerged on the altar of yet another Dolomite sanctuary of peaks and palisades, spent and satisfied. I stood and exhaled the calming breath that comes from knowing your spirit has found “home” again, for a while.